“I believe in the future transmutation of those two seemingly contradictory states, dream and reality, into a sort of absolute reality, of surreality, so to speak.” Andre Breton, Manifesto of Surrealism, 1924. New York photographer David S. Allee’s new series is called Cross Lands. 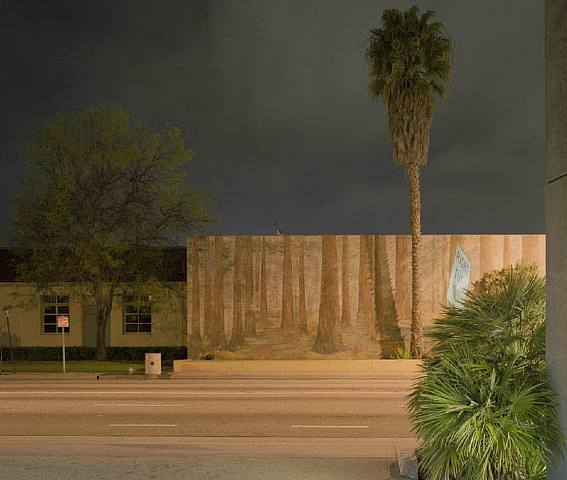 In a way, these photographs exist at the very weird intersection of surreality and urban planning. 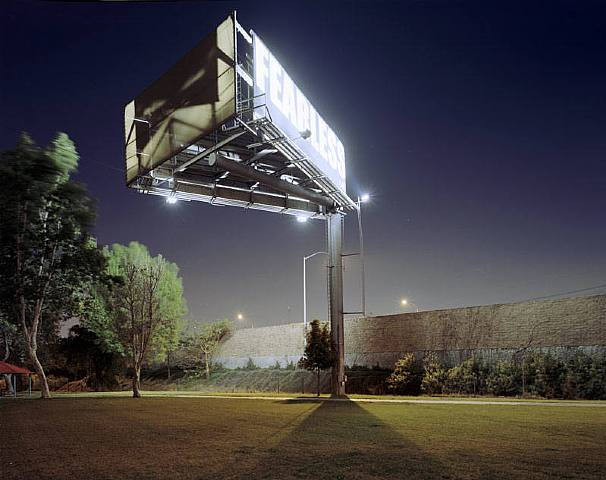 Taken at night with very long exposures (up to twenty minutes) using a large format camera, these photographs have an aura of illusion and unnaturalness. They are somehow both familiar and unfamiliar at the same time. They are examples of Breton’s transmutation of reality and dream. Only part of that surreality is a result of the hour when the photographs were taken. Night often makes the commonplace seem strange, certainly, and the commingling of twilight and artificial light enhances that strangeness. But the weirdness is compounded by the collision of the inorganic with the organic. 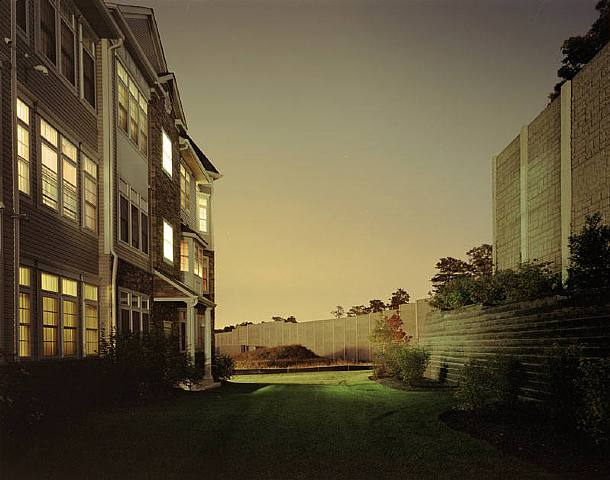 Buildings, condominiums, highways, large-scale signs, strip malls…they’ve all been gracelessly jammed into the landscape with absolutely no regard for context, with no consideration for the fact that people have to live with the result. Consider these condominiums. Consider the care given to the landscaping of the tiny yard, the seeming desire to give the façade a pleasing diversity of appearance, the elegant little porticoed entryway. And then consider the fact that it’s situated maybe forty feet away from, and directly facing, the noise reduction barrier of an interstate highway. The result isn’t merely contradictory; it’s deranged. Added to strange hour and the lunatic urban design (or lack of it) is the fact that most of the photographs in Cross Lands are of places intended to be full of people. Parks, city streets, housing, shops. And yet, because of the hour, people are conspicuously absent. There is what has been described as “a grand and overpowering silence” to the images. A sense of anomic isolation. A rootless feeling of being disconnected and adrift that is both visually appealing and emotionally disconcerting. It’s not surprising to learn the David Allee was, in fact, an urban planner for seven years before he turned full time to photography. Although his art photography is successful, he’s probably better known in New York circles as an architectural photographer. He regularly shoots photos for New York Magazines to illustrate articles ranging from a piece on the tenement building in which Peter Parker had his apartment in the movie Spiderman 2 to the selling of the furnishings of Le Cirque. Allee was also commissioned as the principal photographer for City Art, a book and exhibition examining two decades of public art in New York City. That work pays the rent. The feed the soul, Allee turns to art photography. And there his background in urban planning have given him an almost preternatural eye for the incongruous beauty that grows out of the ugliness of bad urban design. 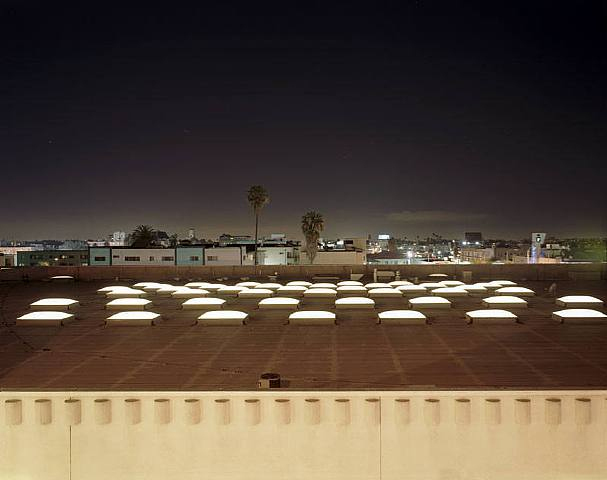 David S. Allee could be said to be the Diane Arbus of architectural photography. His Cross Lands series is powerful, amusing, disturbing, lovely, and at the same time it is a polemic against urban planning that doesn’t take people into considertation.